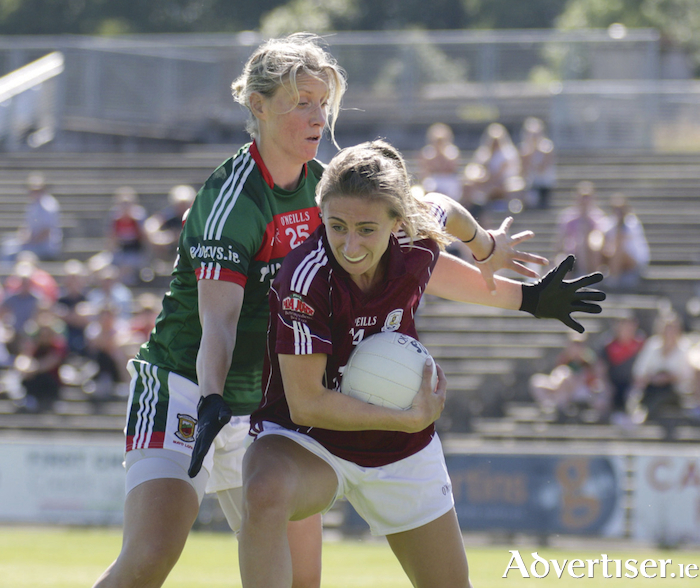 The Galway senior ladies, under the management of Stephen Glennon, were narrow winners over Mayo in the Connacht football final at McHale Park on Sunday. In a riveting and high quality contest, late points from team captain Treacy Leonard and Mairead Seoighe saw Galway deservedly prevail by 0-17 to 1-12. Sunday's victory was Galway's sixth Connacht senior crown in the last seven years, and hopefully it will be the launch pad for a serious tilt at an All-Ireland title over the coming months. Galway started brightly with the breeze at their backs, and early points from Roisín Leonard, Nicola Ward and Treacy Leonard, who produced a top class display, ensured they enjoyed a flying start. Mayo responded well with a few scores, but additional white flags from Moycullen's Aine McDonagh who lined out at midfield, and both Corofin Leonards saw Galway lead by 0-9 to 0-7 at half-time. Mayo women's figurehead, the returned Cora Staunton, kept her side in touch with a few frees and she ended the tie with 0-6 (4fs ). However, in the main she was well marshalled by the Galway rearguard, with Sinead Burke particularly prominent. When Charlotte Cooney was sin binned heading into the last quarter, it looked a tad ominous for Galway, but they responded superbly with real leadership and conviction in their play. Galway ran the bench too with the experienced duo of Noelle Connolly and Sarah Conneally coming into the game, and it was great to see Louise Ward get back onto the field of play after a torrid time with injury. If the Kilkerrin/Clonberne star can get back to full match fitness over the next few weeks and stay injury free, she would be a huge plus for the team heading into the All-Ireland series. Good scores from Conneally and wing back Emer Faherty, after a surging run, put Galway into a commanding 0-14 to 0-10 lead, but they were rocked back on their heels by a stunning goal from Fiona Doherty. It really boosted Mayo's hopes, and they followed up shortly after with another Mayo point to level the tie. The game was in the melting pot at that stage, but Treacy Leonard showed great leadership to cap a super personal display by hitting another point, which was followed up by another flag for Seoighe to see Galway home as Connacht champions 2018. Leonard was delighted with the victory. "We have worked really hard over the past few weeks and months in preparation for this game and all the girls have really pushed each other on and we are happy with our performance and the win," she says. "We knew that Mayo would give us bags of it and they did. We will probably meet them again later in the year and they are a super team. It was great to have a bit of consistency in our display and the girls fought and fought and we notched it up a gear or two in the last few minutes to get out with a win which was very satisfying. "Our defence did really well and our entire panel are a credit. I would like to thank all our management team for the huge work they have put in over the past few months, and it was great to win the Connacht championship as a reward for all the effort everyone involved has put in." Galway now go on to face Waterford and the losing Leinster finalists in the group stages of the All-Ireland series, while Mayo take on the Leinster champions and Cavan. Galway: Lisa Murphy, Fabienne Cooney, Sarah Lynch, Sinead Burke, Charlotte Cooney Nicola Ward (0-1 ), Emer Flaherty (0-1 ), Caitriona Cormican, Aine McDonagh (0-1 ), Olivia Divilly (0-1 ), Treacy Leonard (Cpt ) 0-6 (2f ), Ailbhe Davoren; Mairead Seoighe (0-3 ), Roisin Leonard 0-3 (1f ), Leanne Coen. Subs: Sarah Conneally (0-1 ) for Coen (38 ), Noelle Connolly for Lynch (38 ), Louise Ward for R. Leonard (52, Deirdre Brennan for Davoren (56 ).